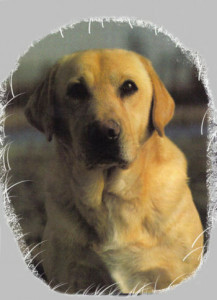 BUSTER came into our lives and joined our Retriever family on April1, 1990. I’ll never forget this day because it was the last day of the 1990 Spring Grand Hunt. This hunt is one of the largest events sanctioned by the United Kennel Club. The club hosting this Grand Hunt was Retrievers Unlimited which Tom and I were both very proud members. It was a very busy, tiring weekend, and we all were running on energy from the excitement of such a grand event. BUSTER was the only male in the litter and based on the combination of the bloodlines of the parent dogs, which was our dog KANDI bred to a Hunting Retriever Champion. We decided to keep him in hopes he would become a magnificent animal both in looks as well as in hunting ability, and style.. He grew to meet our every expectation of him. Ralston Purina chose him 2 years to be one of their dogs to represent their dog food in ads. The first was titled NUTRITION THAT NEVER BLINKS and the second was the CHOSEN BY CHAMPIONS group. BUSTER was a very obedient dog, which made him a great pleasure with which to work. The weekend he was running for his Championship he seemed to have everything all scrambled during training but when it came down to the actual hunt test, he did not put a foot down wrong. He was a great magnificent dog always to be remembered in both beauty as well as ability.